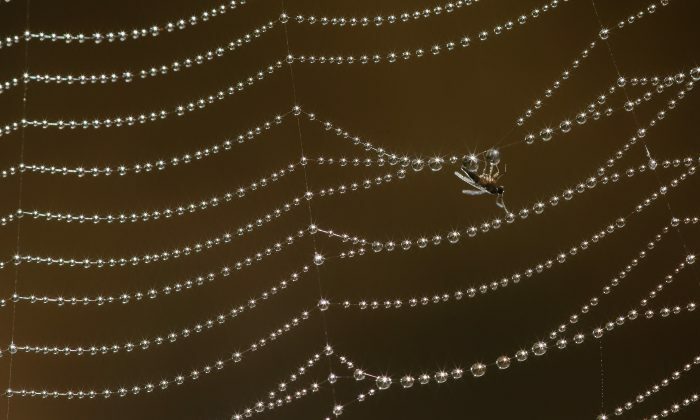 Like many wonders of nature, spider silk has remarkable properties that makes it outshine its manmade counterparts to this very day: spider thread has the same tensile strength — the amount of “stretch” a material can endure without breaking — as steel, but is only one-sixth as dense. The potential applications of spider silk are numerous, especially in medicine, but spiders can’t be farmed like silk worms. Surgeons won’t have to lament this fact much longer: scientists have recently created artificial spider silk using genetically modified bacteria. In the latest issue of Nature Communications, researchers explain the two-step process used to make synthetic spider silk. They first modified bacteria so that it would produce the proteins that make up spider silk, then they fed the material into microfluidic channels that mimic the spinneret, the spider’s silk-spinning organ. The firm yet flexible quality of synthetic spider silk makes it a natural candidate for surgical use, whether as stitches for a flesh wound or scaffolding in an organ transplant. Synthetic silk derives much of its strength from the molecular bonds that form when the proteins are lined up properly. Hydrophobic and hydrophilic proteins are dissolved in water and then extruded through openings at the end of the artificial spinneret’s channels, coming out much stronger than they were originally. The creation of the proteins took severals months, during which time the researchers ran computer simulations of different molecular compounds until they saw the desired stiffness in the material. At the moment, synthetic spider silk is still weaker than its natural version, but researchers are optimistic that their version will eventually surpass natural silk in all respects.